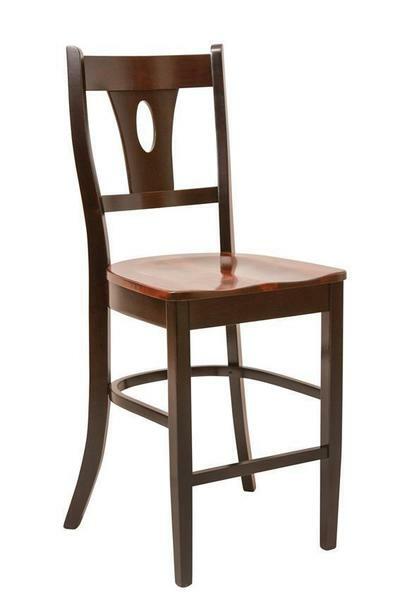 The Amish Annie Barstool is dressed up just enough to greet every occasion from casual dinner to festive party. Annie wears an oval cut out in her bar stool back, a scooped seat, tapered legs, and the solid wood you choose. If you have a small kitchen with no room for a kitchen table, you can get more out of the kitchen bar or counter with comfy, stylish seating like Annie. With solid wood construction and expert craftsmanship, the Amish Annie Barstools are Amish furniture you can have for always. Please see what others are saying about their experience with DutchCrafters on our Reviews Page. If you have any questions, we have Furniture Specialists available by phone or email. Give us a call today!